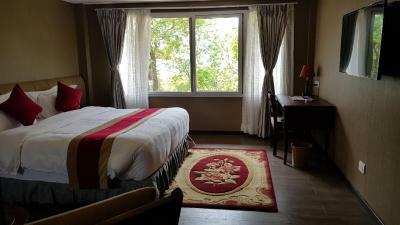 Lock in a great price for Himalayan Front by KGH Group – rated 8.9 by recent guests! This was a beautiful hotel, the nicest we stayed at in Nepal. The views from the 6th floor rooftop were spectacular for sunrise. Everything else. The view is too good to be true, and at times it felt like you're looking into photoshopped image. 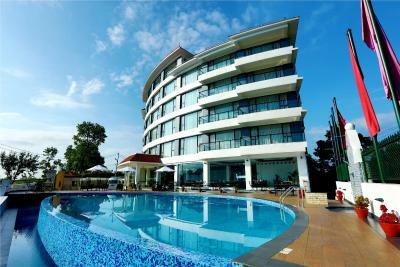 Hotel was very clean,staff were excellent and very helpful. And it had all the facilities that you'd need. 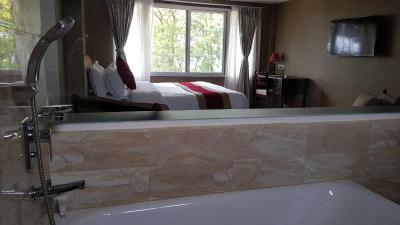 But the main selling point for me was the room with the mountain view. 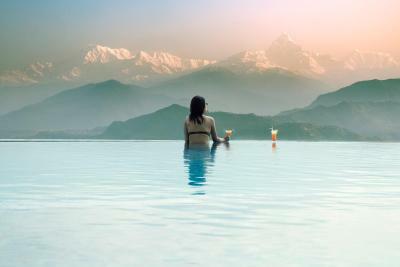 Oh, and that infinity pool with a direct view of the city and Himalayan mountains is just heaven. The pool and beds were very nice. The view was also great. 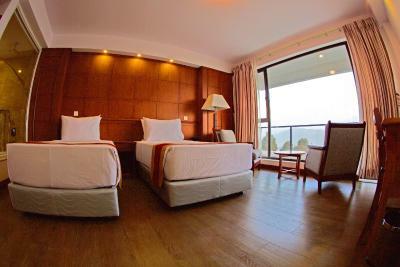 Extremely quiet, clean, well-kept facilities, beautiful views of the mountains, extremely helpful hotel staff who pay attention to their guests. Location. Standing in my balcony felt like floating in the clouds. I can't complain about the room. Although I didn't see the mountains because of the weather, it has a lovely view. 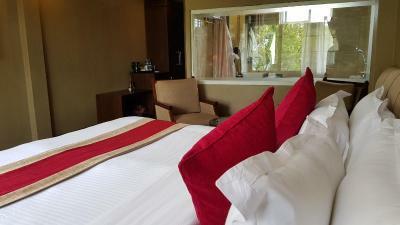 The view from the room was excellent and the staff were helpful and friendly. The hotel was clean and the room was comfy and spacious. Great view and facilities. Having tea while enjoying the view of the mountains was the highlight moment of my whole trip in Nepal. The restaurant is also good, the Himalaya Front special salad is soooo delicious. 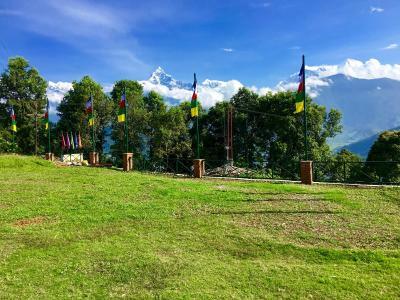 The hotel is on the way to Sarangkot and the start point of paragliding, but far away from lakeside and any other places. But they offer pick up from the airport, which is great. 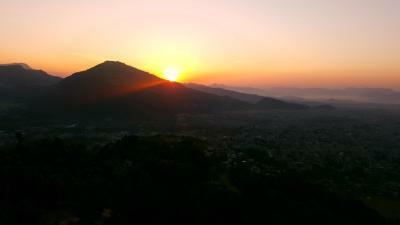 If stay here, there’s no need to go to Sarangkot for sunrise. When weather is good, You can see spectacular sunrise right in your bed. 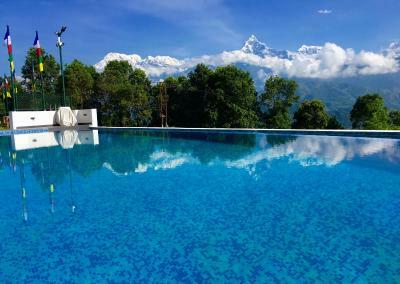 For anyone go to Pokhara, this hotel is definitely worth staying for one night or two, just remember to check the weather before going. Himalayan Front by KGH Group This rating is a reflection of how the property compares to the industry standard when it comes to price, facilities and services available. It's based on a self-evaluation by the property. Use this rating to help choose your stay! 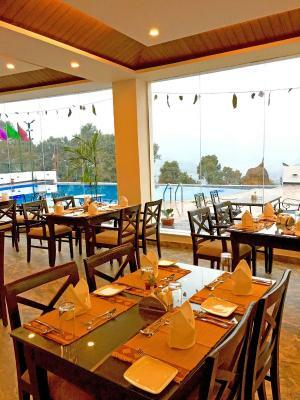 One of our top picks in Pokhara.Located in Pokhara, 2.7 mi from Fewa Lake, Himalayan Front Hotel features a restaurant, rooftop lounge and free WiFi throughout the property. 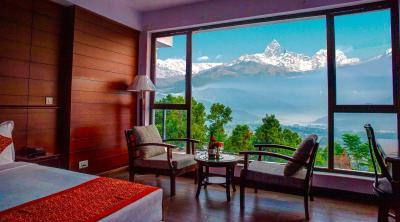 The property offers majestic view of the Annapurna Range. 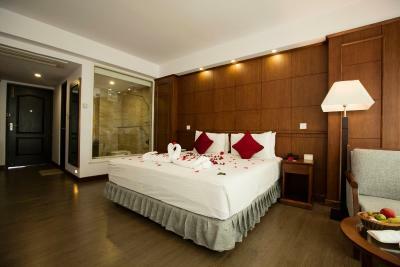 All rooms are equipped with a flat-screen TV with cable channels. Some rooms feature views of the mountains or city. 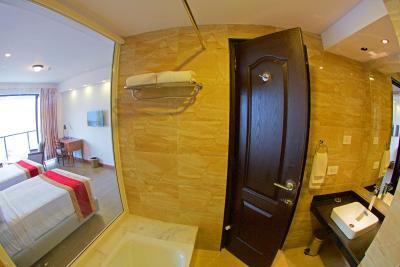 Rooms are equipped with a private bathroom equipped with a bath or shower. For your comfort, you will find slippers, free toiletries and a hair dryer. 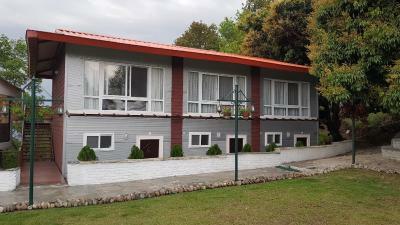 Car hire is available at this hotel and the area is popular for hiking. 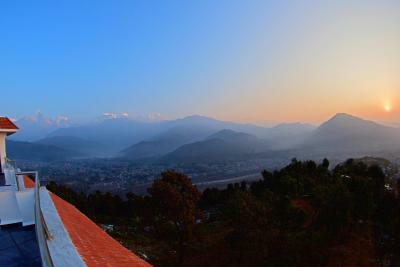 World Peace Pagoda is 3.1 mi from Himalayan Front Hotel, while Mahendra Cave is 2.5 mi from the property. When would you like to stay at Himalayan Front by KGH Group? This twin/double room features a electric kettle, air conditioning and tumble dryer. 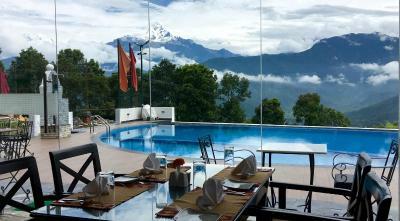 The Himalayan Front Hotel in Sarankot, Pokhara is the latest venture of the KGH Group of Hotels. 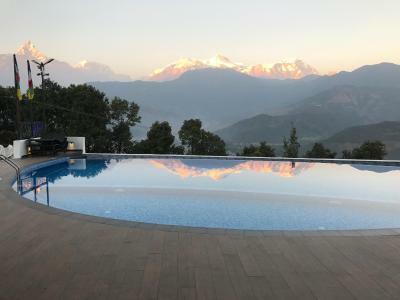 The first hotel of its kind in the serene hills of Sarankot, offers a majestic view of the whole Annapurna range – Macchapuchhre and Annapurna South. 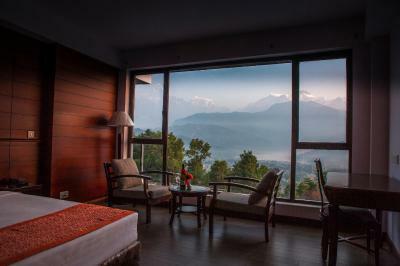 Every room has a panoramic view of the mountain range and the Pokhara valley below. The biggest highlight is the seamless infinity swimming pool in which you feel like you are swimming right under the lap of the mountains. The rooftop lounge has a grander 360 degree view and the cozy ambiance with a fireplace truly engages one for a cherished gathering. 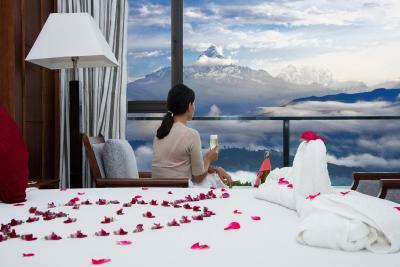 For all the things the mountains offer, Himalayan Front Hotel is a perfect launch pad to trek around the surrounding hills, do short escorted hikes, paraglide or just soak in the unobstructed golden sunrises and sunsets of the Annapurna range from your room and even the bathtub. If you are seeking to spend a few days in tranquility with luxury around nature, then Himalayan Front is the perfect new destination. The hotel will definitely redefine your visit to Pokhara next time. 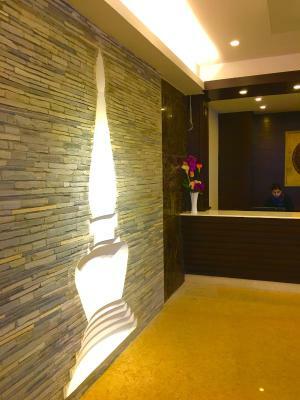 House Rules Himalayan Front by KGH Group takes special requests – add in the next step! Himalayan Front by KGH Group accepts these cards and reserves the right to temporarily hold an amount prior to arrival. Please note that if the booking is canceled or modified up to 3 days before date of arrival, 5% of the total price of the reservation will be charged. Please inform Himalayan Front by KGH Group of your expected arrival time in advance. You can use the Special Requests box when booking, or contact the property directly using the contact details in your confirmation. After explaining to staff that I am coeliac (gluten free) and showing them a note in Nepalese and being told they understood, I was then served the wrong food, resulting in me being very sick. 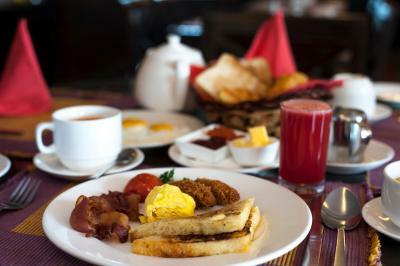 The following morning the manager made excuses but didn't apologise and considering the location, I didn't want to stay another night in a place where I couldn't trust the food. The staff then became very unhelpful and instead of the shuttle back to town, ordered me a taxi. I was subsequently accused of not paying (no one asked me to pay before I left so I thought I had via booking.com) and threatened with police action when really, I was relying on WiFi and therefore not ignoring their calls and messages but was offline. It was very far from the main town which was not really clear when i made the booking. Loved the view from the hotel! The breakfast was good but not enough options for special dietary requirements i.e lactose intolerant etc. They arranged for us to have the best view room. I got engaged there and thats why im very greatfull that i had what i wanted for this moment. The view is something amazing. 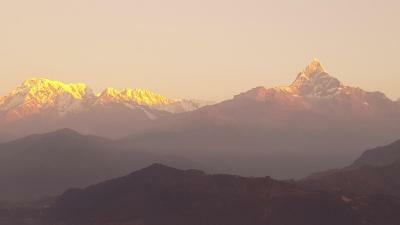 The photos from the room facing the Himalayas are like cart postal. Thank you a lot. We will always remember the stay to you!! Strongly Recommend this! 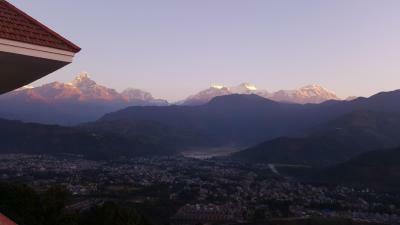 Beautiful Himalayas view!! The room safe wasn't working. Our room had THE BEST view. All staff are friendly and professional. The mountain views were truly unbeatable. 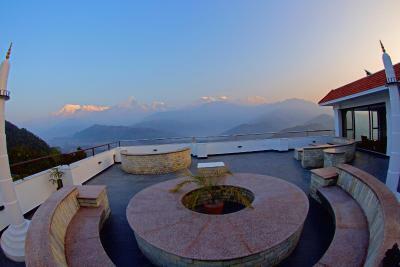 If you stay here, there’s no need to do the Sarangkot sunrise tour, as the best mountain views are from your hotel room, and even from the tub in your bathroom (as the walls are all glass). Sunrise, sunset- it’s all magical. We loved it so much that we cancelled our stay at the lakeside and extended our stay here at Himalayan Front- and then stayed in all day in awe of the majestic mountains. Breakfast at the glass-walled lobby restaurant opened to the same views. And there’s also a beautiful rooftop with a lounge, so there’s actually quite a few spots in the hotel to enjoy the view from! Everything else about this property is also par excellence. Great omelettes (no squishy centres like at other hotels) for breakfast, fantastic service by the sweet and friendly staff. 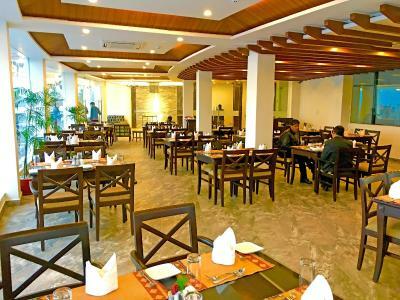 We ordered a thakali (local platter of dishes) to the room one day for dinner, and were wowed. 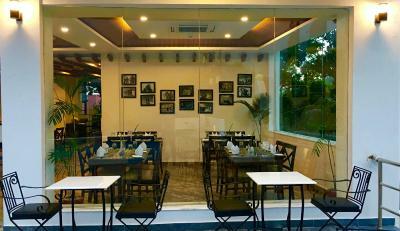 Better than a renowned thakali restaurant in the lakeside area. The peanut sadeko was also delicious. 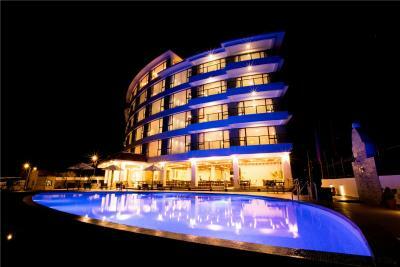 Kudos to the hotel team for managing a well-serviced, well-maintained and efficient hotel, and always looking out for guests’ interests.